For those here from the Costco Meals post, welcome to my One Dish Dinners site. 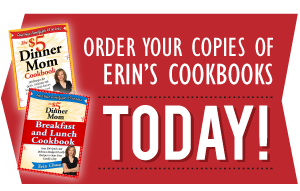 Stick around and check out the other recipes. A note about this recipe, ham is not on the Costco list because they don’t sell it in small enough portions for this particular set of meals. My suggestion, use any you have in the freezer leftover from a holiday meal…OR cut up 2 links of the chicken and apple sausage and toss it with the potatoes before putting in the oven to bake the eggs. Ingredient substitution: Chop up 6 of the gold potatoes into bite size pieces and saute as directed. 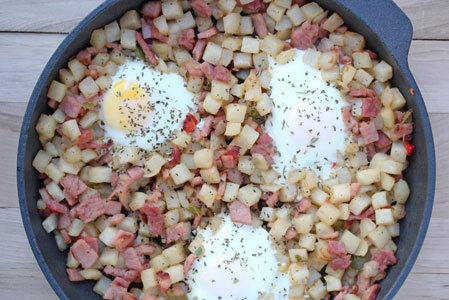 I love the combination of flavors in this dish – it is a hearty, country breakfast! Can’t wait to try this one. It just might be dinner tonight to give it a test spin! My kids have found the wonders of shredded hashbrowns. I’m now required to fix this dish with a topping of cheese several times a month. If only I could add vegetables to the cooking process…picky brats lol! This paragraph posxted aat this web sit is really pleasant.